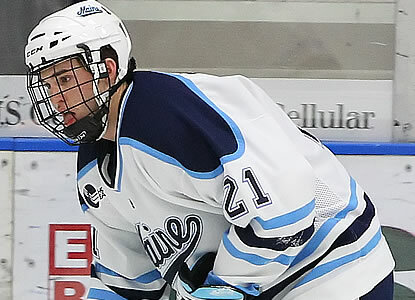 ORONO, Maine -- Kyle Beattie's (Avondale, Ariz.) goal midway through the second period proved to be the difference as the University of Maine men's ice hockey team defeated Merrimack 2-1 on Friday night in the first of their best-of-three series at Alfond Arena. Maine improves to 21-11-3 on the season, while Merrimack falls to 17-11-7. Mike Collins started the scoring when he gave Merrimack a 1-0 lead with his 10th goal of the season, 15:33 into the first period. With the Warriors skating on the power play, Connor Toomey controlled the puck in the Maine zone. Toomey moved the puck over to Collins who snuck a shot over the glove of Maine goaltender Dan Sullivan (York, Pa.). Maine answered, tallying a pair of goals in the second period to take a 2-0 lead. Maine got on the board when Joey Diamond (Long Beach, N.Y.) scored his team-leading 23rd goal of the season. Spencer Abbott (Hamilton, Ontario) controlled the puck at the opposite blue line before unleashing a tape-to-tape pass through the neutral zone and right to Diamond, who had a step on the Merrimack defense. He fired a shot, beating Warrior goaltender Joe Cannata top shelf to his glove side. Just over four minutes later, Kyle Beattie gave the Black Bears a 2-1 edge with his sixth goal of the season and what would turn out to be the game-winner. John Parker (Green Brook, N.J.), who got the puck from Brice O'Connor (Londonderry, N.H.), was able to find Beattie. Beattie picked up the puck and skated into the right faceoff circle, firing a wrister past Cannata. The goaltenders stole the show the remainder of the night. Sullivan stopped 20 shots and improves to 20-8-3 on the season. Joe Cannata made 41 saves in goal for the Warriors. He falls to 16-11-7. Maine finished the game with a commanding 43-21 edge in shots on goal. The 43 shots on goal tied a season-high for the Black Bears. Maine scoreless in three opportunities on the power play, while Merrimack scored on one of their man-advantages.